Well, the good news is that Britain’s Queen Elizabeth II is gracing the Wimbledon Tennis match after more than three decades. She visited some 33 years before in 1977 when she presented Virginia Wade with the ladies' singles championship. 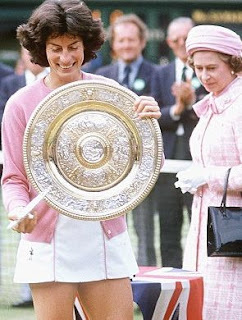 And incidentally, that was the last time a Briton won a singles title. This time she chooses to witness the men singles match between fourth seeded Briton’s Murray on Center Court Thursday against Jarkko Nieminen of Finland. Now the big question – whether to bow to the Queen while playing or not. Till 2003, the players did show their courtesy to any royal audience in attendance. The compulsion was done away with in 2003, much to the relief of the players, but it was left to the players to show the gesture. An official of the Wimbledon has told reporters that players are not being told officially to bow to the Queen and the bowing is left entirely to the players. Murray is finding it difficult and is nervous as whether he can do it right or not. Talking to reporters, he said, "It should be, you never know. I will probably be a bit nervous and I don't want to mess up at all." As for Nadal, who is to meet Robin Haase of the Netherlands, it is not very clear that he would get a chance to grace the Queen as the Queen may not stay on court for that long after witnessing Murray. But he seems ready as well. While Serena Williams who has been rehearsing her courtesy, is also not scheduled to play on Thursday. So she is going to miss, or get relieved, of not having to perform the royal rituals.